Invariant Imbedding T-Matrix Method for Light Scattering by Nonspherical and Inhomogeneous Particles propels atmospheric research forward as a resource and a tool for understanding the T-Matrix method in relation to light scattering. The text explores concepts ranging from electromagnetic waves and scattering dyads to the fundamentals of the T-Matrix method. 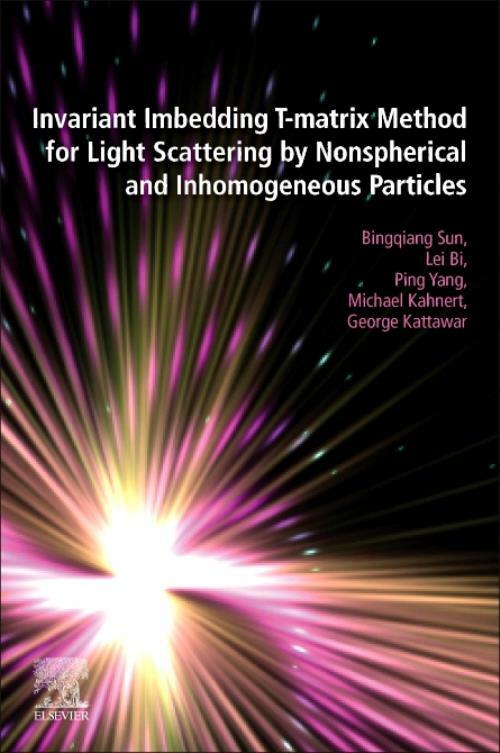 Providing recently developed material, this text is sufficient to aid the light scattering science community with current and leading information. Enriched with detailed research from top field experts, Invariant Imbedding T-Matrix Method for Light Scattering by Nonspherical and Inhomogeneous Particles offers a meaningful and essential presentation of methods and applications, with a focus on the light scattering of small and intermediate particles that supports and builds upon the latest studies. Thus, it is a valuable resource for atmospheric researchers and other earth and environmental scientists to expand their knowledge and understanding of available tools. Bingqiang Sun is an Assistant Research Scientist in the Department of Atmospheric Sciences at Texas A&M University, College Station, TX, USA. He has published 10 journal papers. He received a B.S. degree from Shandong Normal University, Shandong, China, in 2007, M.S. degree from Peking University, Beijing, China, in 2010, and Ph.D. degree from the Department of Physics & Astronomy at Texas A&M University in 2014. He received the Yuxiang Young Scholar Award by Chinese-American Oceanic and Atmospheric Association (COAA) in 2017. Lei Bi is Professor in the Department of Atmospheric Sciences at Zhejiang University, Hangzhou, China. He has published 41 journal papers and 2 book chapters. He received B. S. and M. S. degrees from Anhui Normal University and Beijing Normal University, China, in 2003 and 2006, respectively, and a Ph. D degree from Texas A&M university, Texas, USA, in 2011. Dr. Bi is a recipient of the Richard Goody Award by Elsevier and the Journal of Quantitative Spectroscopy and Radiative Transfer (JQSRT). He serves as an associate editor of the JQSRT and an editor of the Asia-Pacific Journal of Atmospheric Sciences. Ping Yang is Professor in the Department of Atmospheric Sciences at Texas A&M University, College Station, TX and the David Bullock Harris Chair in Geosciences. Yang has published 309 journal papers, 11 book chapters, and 3 books. He received B.S. and M.S. degrees from Lanzhou University and Lanzhou Institute of Plateau Atmospheric Physics/Chinese Academy of Sciences, Lanzhou, China, in 1985 and 1988, respectively, and a Ph.D. degree from the University of Utah, Salt Lake City, UT, USA, in 1995. Yang is a Fellow of the Optical Society of America (OSA), American Geophysical Union (AGU), and American Meteorological Society (AMS). Michael Kahnert is an adjunct professor at the Department of Space, Earth and Environment at Chalmers University of Technology, Gothenburg, Sweden, and research leader for aerosols and radiation at the Swedish Meteorological and Hydrological Institute. He has published 1 book, several book chapters, and 75 journal papers. He received his M.S. degrees in Physics at the Free University of Berlin, Germany, in 1994, his Ph.D. degree at the University of Alaska Fairbanks, USA, in 1998, and his Habilitation degree at Chalmers University of Technology, Gothenburg, Sweden, in 2010. Kahnert presently serves on the editorial board of JQSRT and of Scientific Reports. George Kattawar is Professor Emeritus in the Department of Physics and Astronomy and the Institute for Quantum Science and Engineering at Texas A&M University, College Station, TX. He has published 235 journal papers, 3 book chapters, and1 book. He received a B.S. from Lamar University (Highest Honors) and the M.S. and Ph.D. from Texas A&M University in 1961 and 1964 respectively. Kattawar won the Distinguished Texas Scientist Award in 2011, the Jerlov Award in 2014, and the van de Hulst Light Scattering Award in 2015. He is a Fellow of the Optical Society of America (OSA).